As humanities scholars increasingly recognize the value of public engagement, and as the proportion of tenure-track faculty positions available to new graduates continues to decline, many humanities programs are focusing renewed attention on equipping graduate students for careers as scholars both within and beyond academe. To support those efforts, the Scholarly Communication Institute has carried out a study investigating perceptions about career preparation provided by humanities graduate programs. The survey results help to create a more solid foundation on which to base curricular reform and new initiatives by moving the conversation about varied career paths from anecdote to data. The findings make it clear that there are a number of effective interventions that programs can undertake. Many of the skills that people working beyond the tenure track identify as crucial to their positions — things like project management, collaboration, and communication — are also highly beneficial to those working within the professoriate. Structuring courses and projects in a way that emphasizes the acquisition of these skills not only contributes to the success of students who pursue employment outside the tenure track, but also to the vibrant research, teaching, and service of those who pursue academic roles. With the availability of new data to work from and the recommendations above as possible guiding principles, graduate programs have a robust set of tools available that can help facilitate curricular assessment and new initiatives. As the importance of assessing the effectiveness of existing structures and considering potential benefits of reform continues to grow, humanities programs have a strong incentive to demonstrate the ways that their graduate programs contribute to the vitality of the university and the broader public sphere. Equipping graduate students with the skills and literacies needed for 21st century scholarly work — from technical fluency to an understanding of organizational structures — is critical to ensuring continued rigorous and creative research, scholarship, and teaching. Graduate students in the humanities thinking about their future careers face a fundamental incongruity: though humanities scholars thrive in a wide range of positions, few graduate programs systematically equip their students for varied post-graduate opportunities. And yet, academic employment is an increasingly distant prospect for many doctoral recipients, with a dwindling proportion of tenure-track jobs available to an ever-growing pool of graduates. While the disconnect between the availability of tenure-track jobs and the single-minded focus with which graduate programs prepare students for that specific career path is not at all new, the problem is becoming ever more urgent due to the increasing casualization of academic labor — the shift from full-time positions to piecemeal adjunct positions, most of which offer menial salaries, no benefits, and no job security — as well as the high levels of debt that many students bear once they complete their degrees. At the same time, people with advanced humanities degrees who find stimulating careers in and around the academy but outside the tenure track are becoming increasingly open about their experiences, as is clear from the vibrant activity on websites such as #Alt-Academy , Versatile PhD, and more [“#Alt-Academy” 2011] [“VersatilePhD” 2010]. Despite the fact that many graduates continue to identify as part of the scholarly world while pursuing satisfying careers beyond the professoriate, to date there has been very little data available about this body of “alternative academic” scholars — people with advanced training in the humanities who do not pursue careers as tenure-track faculty members, but instead work in and around academic structures in arenas like libraries, museums, archives, humanities centers and labs, presses, and more. While graduate programs can help prepare junior scholars for a much broader professional world than simply the professoriate, without robust data it can be extremely difficult to make a case for changes, or even to know what kinds of changes would be effective. To that end, the Scholarly Communication Institute (SCI) has completed a study investigating perceptions about career preparation provided by humanities graduate programs. The survey results help to create a more solid foundation on which to base curricular reform and new initiatives. Given the limitations of previously collected data, SCI’s study is an effort to provide faculty and administrators with the data they need to assess and strengthen existing programs, to implement changes where appropriate, and to support efforts to increase transparency regarding career preparation and post-graduate outcomes of emerging scholars. It should be considered in conjunction with two complementary elements of SCI’s most recent phase of work: meeting reports from a series of workshops on reforming humanities graduate education [Rumsey 2013a] [Rumsey 2012], and the exemplary models of innovative scholarly training showcased in the Praxis Network [“Praxis Network” 2013]. With the ongoing employment challenges for humanities PhDs in mind, and with an eye toward the wide-ranging conversations related to careers beyond the tenure track, SCI’s study uncovered patterns in the perceptions among humanities scholars and their employers on topics such as career preparedness, skills and competencies, motivations, performance, and more. While tenure-track faculty positions remain the primary career goal of a large majority of humanities doctoral students, the percentage of graduates that obtain tenure-track positions is becoming ever smaller. 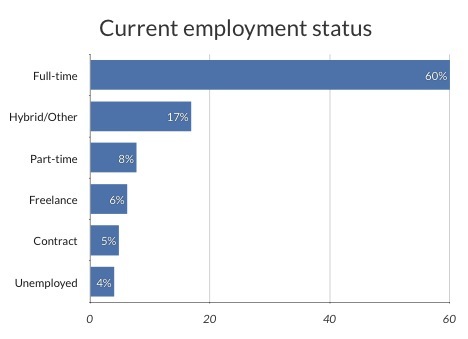 The 2011 report on the Survey of Earned Doctorates indicates that 43% of humanities PhD recipients have no commitment for either employment or postdoctoral study at the time of degree completion [“Survey of Earned Doctorates, 2011” 2012]. As the American Association of University Professors (AAUP) notes in their annual report on the state of the profession, academic employment is increasingly shifting to part-time and contingent positions, with 76% of all teaching positions being filled by instructors in contingent roles as of 2011 [AAUP 2013]. This trend means that proportionally fewer tenure-track lines are available to new graduates, compounding the problem. Notably, a 2013 Inside Higher Ed survey of chief academic officers reveals that provosts expect equal or greater reliance on adjunct labor in coming years, and demonstrated little faith in a continued tenure system [Jaschik 2013]. Given these realities, continuing to view tenure-track employment as the sole expected professional outcome for humanities doctoral recipients is untenable. Reforming doctoral education requires a multi-pronged approach. We must at once advocate for and work towards fair labor practices for contingent faculty members; lobby against the trend toward casualization; and support graduate students in the pursuit of more varied careers. Support entails not only opportunities for skill development, but also greater recognition of what constitutes post-graduate success. While earlier initiatives, most notably the 2000-2006 Responsive PhD project, have also worked to shift university paradigms and encourage better career preparation for graduate students [“Responsive PhD” 2005], their resulting methods and recommendations have not been widely adopted. More recently, the report of the Modern Language Association’s Task Force on Doctoral Education offered a suite of strong recommendations on reforming the humanities Ph.D. [“Report of the Task Force on Doctoral Study” 2014]. The report is too new to assess uptake and outcomes, but it signals the importance of the issue to the discipline as a whole, and provides a useful starting point for discussions that can lead to real action. The fact that tenure-track employment opportunities are becoming scarcer relative to the number of graduates does not necessarily imply that too many people earn PhDs, or that graduate programs should reduce their admissions. Most humanities programs do not need to be stripped down, but on the contrary, made more robust. Departments need sufficient resources to allow them to invest in full-time employment lines and to provide funding and support for graduate students. Reducing a program’s size can lead to decreased funding, which may prompt programs to meet teaching needs by hiring adjunct faculty on an as-needed basis as undergraduate enrollments continue to rise ([IPEDS 2009]; see [Laurence 2014a] and [Laurence 2014b] for data analysis). The casualization of academic employment in the U.S. exemplifies a shortsighted view of the ways that labor conditions affect student learning outcomes. The poor working conditions for many adjunct instructors — who are stretched among multiple part-time contracts, with low pay, no benefits, and few institutional resources — are directly and indirectly passed on to students. Worse, in some universities, courses are so oversubscribed that some universities, including the University of California system, are entertaining proposals to shift many introductory courses to online environments run by third parties — specifically, Massive Open Online Courses, or MOOCs — leaving students without the direct guidance, mentorship, or expertise of any instructor at all [Fain and Rivard 2013]. Further, reducing doctoral programs in response to low tenure-track employment rates strips other employment environments — whether scholarly, cultural, governmental, non-profit, or something else entirely — of the advantages that deeply trained humanists can offer. As Abby Smith Rumsey has argued, a broad range of opportunities are available to graduates who look beyond the university, where many organizations have a significant need for the skills and approaches that humanists could offer [Rumsey 2013b]. Humanities programs should not be sacrificed in deference to problematic labor trends; rather, the moment is right to consider the value that humanities education can provide in a broader range of roles that are more deeply engaged with the public, and to encourage students to focus on new ways to engage in public discourse. Many positions that help to translate humanities study into a broader public good are a part of the growing discourse of “alternative academic” careers, often referenced by the Twitter hashtag, #altac (or #alt-ac). Coined in a 2009 Twitter conversation between Bethany Nowviskie and Jason Rhody, the phrase refers to individuals with graduate training in the humanities who are off the tenure track, while still working in and around academic and scholarly systems [Nowviskie 2012a]. Nowviskie went on to create #Alt-Academy , an online volume of essays treating a range of topics related to the pursuit and development of these various careers [“#Alt-Academy” 2011]. The changing nature of career paths for humanities scholars is an issue of particular concern to digital humanities practitioners, who have long been working in hybrid roles that combine elements of traditional scholarship, like research and teaching, with other elements, such as software development, librarianship, high-level administrative responsibilities, and more. 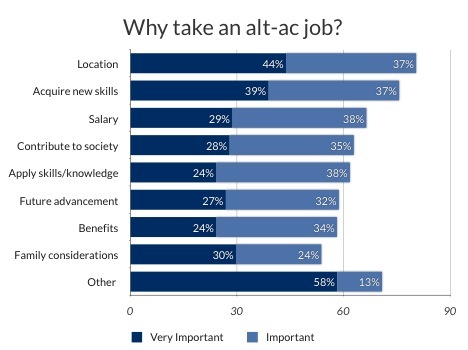 These roles are not new, but until recently the scholarly community has lacked a satisfying way to refer to such careers; they are now commonly discussed as #alt-ac roles. Many of the skills implicit in digital humanities scholarship and work products — including collaboration, project management, and technological fluency — are becoming increasingly important in new models of graduate training, even among programs not specifically allied with the digital humanities. The spheres of alternative academic careers and the digital humanities can be best understood as a Venn diagram, with significant areas of overlap as well as distinctive qualities. Many fruitful conversations and initiatives related to broadening career paths have emerged from the digital humanities community, and there are important reasons why this is the case. At the same time, the two areas are not identical; many digital humanists work as tenured and tenure-track professors, while many who identify as working in alternative academic roles do not engage in the kinds of scholarship or practice associated with the digital humanities. While the scope of the alternative academic umbrella is the topic of a great deal of conversation and some contention, it is also possible — and perhaps more productive — to take a broad view that is defined not so much by the specific job or career, but rather by a kind of approach. People that identify with the term tend to see their work through the lens of academic training, and incorporate scholarly methods into the way that work is done. They engage in work with the same intellectual curiosity that fueled the desire to go to graduate school in the first place, and applying the same kinds of skills — such as close reading, historical inquiry, or written argumentation — to the tasks at hand. This kind of fluid definition encourages us to seek out the unexpected places where people are finding their intellectual curiosity piqued and their research skills tested and sharpened. In addition to the rich narrative material gathered at #Alt-Academy , several previous studies provide groundwork for SCI’s recent work. In particular, the 2012 report by the Council of Graduate Schools (CGS) and the Educational Testing Service (ETS) titled “Pathways Through Graduate School and Into Careers” provides a wealth of valuable information [Council of Graduate Schools 2012]. As the CGS/ETS report notes, “the issue of career transparency presented the biggest gap in data” from previous studies [Council of Graduate Schools 2012, 2]; the report sought to correct that gap. An earlier study, “Ph.D.’s — Ten Years Later” [Nerad and Cerny 1999], explores the experiences of Ph.D. holders working in business, government, and non-profits. It provides an incredibly useful baseline, but data was gathered from 1982 to 1995, and no longer accurately reflects the current academic or employment environments. Census data, such as the annual Survey of Earned Doctorates, provides invaluable data on doctoral recipients and their work commitments on graduation, but does not investigate the nature of that work, nor does it track graduates’ careers beyond initial positions. While all of these studies provide useful foundational information and analysis, they do not assess finer-grained issues particular to the humanities. A number of other projects related to the career prospects of humanities scholars have been conducted in partnership with specific departments and graduate programs. These include the Carnegie Initiative on the Doctorate (2001-2005) and the Woodrow Wilson Foundation’s Humanities at Work (1999-2006) and Responsive PhD (2000-2006) programs. The Carnegie Initiative on the Doctorate partnered with English departments at four universities and history departments at six, each of which engaged in specific interventions to their doctoral programs, such as revising curriculum, increasing mentorship opportunities, rethinking the comprehensive exam, and more [“Carnegie Initiative on the Doctorate” n.d.]. Humanities at Work provided practicum grants to doctoral candidates, funded postdoctoral fellowships, and also established WRK4US, later to become Versatile PhD. The Responsive PhD program partnered with 20 universities and helped document best practices related to professional development [“Responsive PhD” 2005]. While all of these programs likely proved useful to the specific departments and individuals involved, and perhaps more broadly through retrospective reports and recommendations, their success is difficult to quantify and therefore challenging to scale and replicate. Few of the programs involve even track the career outcomes of their graduates, for instance, making it exceedingly difficult to gauge whether the projects have had a lasting benefit. Further, the career-related focus tends to be on PhDs working in “non-academic” jobs, a problematic label that excludes or mischaracterizes the roles of people working in hybrid roles within and around university structures. Finally, these programs, as well as the studies mentioned above, have tended to focus on a narrow subset of disciplines (often only English) as stand-ins for the full range of the humanities, which gives an incomplete picture. By focusing on a narrower segment of the academic population — humanities scholars working outside the tenure track — SCI’s study can probe more deeply into issues that concern that group. The study consisted of two main phases: one public, one confidential. The first phase involved creating an exploratory public database of self-identified alternative academic practitioners. The database was built within the framework of the #Alt-Academy project in order to leverage the energy of existing conversations. The second phase comprised two confidential surveys. The primary survey targeted people with advanced humanities degrees who self-identify as working in alternative academic careers, while a second targeted employers that oversee employees with advanced humanities degrees. Because we were working with a somewhat nebulous population, our subsequent distribution focused on “opt-in” strategies — especially social media, listservs, and traditional media coverage. While this method has limitations, we hoped to learn something not only from the content of the responses, but from the number and type of respondents. An unknown population with undefined boundaries. The community of people that self-identify as working in alternative academic careers is difficult to define. Boundaries are porous, especially considering that so many scholars are employed in hybrid roles, perhaps teaching a class or two in addition to running a humanities center. Our priority was not to set boundaries, but rather to identify and examine patterns. Impossibility of achieving a representative sample. Our respondents cannot be considered a representative sample, in part because of the difficulties of defining the population. Aside from promoting the placements of those graduates who find tenure-track faculty positions, most departments do not track the career outcomes of their graduates, so we had no database or core population to target. Instead, our work simultaneously helps to explore the range of careers that people identify as alternative academic, while also surveying the career preparation of individuals working in those positions. Methodological constraints. Because of the difficulties related to the population, as well as constraints on the timing and personnel for the study, we relied on social media, crowdsourcing, and listervs to disseminate the study. We cannot determine response rate, because we did not distribute the survey to a known number of people. Self-reporting. By design, the study examines the perceptions of employees and employers regarding employees’ career preparation. Self-reported results cannot be verified for accuracy. However, we hoped to limit some of the bias inherent in self-reported answers by approaching the questions from two angles, through the perceptions of both employees and employers. Despite these challenges, the data reveals interesting patterns that can help inform the conversation. While the results cannot be generalized to the entire population of alternative academics (in part because it is a fluid, loosely-defined community), they can contribute to a more informed discussion and sound recommendations. They can also provide a foundation on which to base future research. Dr. Katina Rogers, Senior Research Specialist at the Scholarly Communication Institute, was lead researcher on the project. Oversight was provided by Dr. Bethany Nowviskie, Associate Director, and Dr. Abby Smith Rumsey, Director of the Scholarly Communication Institute. In consultation with Dr. Nancy Kechner, ITC Research Computing Consultant at the Scholars’ Lab, Rogers developed an 89-question instrument for employees, and a 24-question instrument for employers. The instruments include multiple choice, Likert scale, and open-ended questions, and include branching structures. The instruments underwent several rounds of testing in order to strengthen and optimize them. The surveys were opened to the public on July 10, 2012, and were closed on October 1, 2012. In total, we obtained 773 responses to the main survey, of a total of 938 surveys started, for a drop-out rate of 17.6%. The most common disciplinary fields were English (19.6%) and history (18.51%), with a wide range of other disciplines represented in small numbers. On the employer survey, 73 responses were obtained, of a total of 103 surveys started, for a drop-out rate of 29.1%. Respondents were permitted to skip any questions that they did not wish to answer. The high number of responses enables us to determine meaningful trends within the data, in order to make recommendations to humanities programs and centers wishing to modify their curricular offerings. Because we were working with a category of employment that is defined only loosely, and because we hoped that the survey results would help to clarify what people mean when they talk about “alternative academic” careers, it was important to us not to be too prescriptive in determining who was and was not eligible to participate. By allowing some flexibility, we hoped that in addition to the data obtained from the responses themselves, we might also learn more about how the broader community thinks about career paths beyond the tenure track. For this reason, we left the parameters loose. The public database of people who self-identified as working in alternative academic careers, which we developed in the first phase of the study, provided an initial pool of approximately 250 potential respondents. We then disseminated information about the survey through social media, professional societies, relevant email distribution lists, an independent write-up in the Chronicle of Higher Education [Cassuto 2012], and discussion at pertinent meetings and conferences. The study is neither longitudinal nor a comprehensive look at a single cohort; rather, it provides a starting point for understanding the current state of affairs. As such, the data it provides is fundamentally different from long-running annual studies like the Survey of Earned Doctorates. We hope that other studies will build on the work we're doing now; to that end, the datasets are publicly available for further analysis and extension [Rogers 2013a] [Rogers 2013b]. The general contours of the findings make it clear that people tend to enter humanities graduate programs expecting to become professors; they receive very little advice or training for any other career; and yet many different circumstances lead them into other paths. Examining the specific data more closely helps to ground general or anecdotal impressions in a more substantial foundation. One salient fact can be seen in the response rates themselves. The main survey received approximately ten times more responses than the employer survey. There are a number of possible reasons that this would occur; employers have multiple demands on their time, for instance, and unless they routinely hire people with advanced humanities degrees, they may not perceive enough potential return on the time they would invest in completing the survey. Beyond practical reasons for the difference, the fact that such a broad gap exists between the numbers of respondents to the two surveys also suggests mismatched incentives between the two groups. The motivation for an employer to complete the survey, compared to that of a former graduate student in an alternative academic position, is very different. While employed scholars are invested in the outcome of the study because it promises to affect the paths of people who take similar paths, employers do not have such a clear reason for investment in the study. If humanities PhDs have inadequate training for a position, an employer will simply hire someone better suited to the job. Those embedded in humanities programs may see the value of hiring humanities PhDs in varied lines of work, but this value is often not well articulated, either because stakeholders do not perceive this to be a critical aspect of their roles, or because they face too many competing demands to devote the time necessary to make the case. Leaders in the humanities community face increasingly heavy burdens related to funding, staffing, and other resource-related questions. Further, departments and centers embedded within university structures are slow to change, making it difficult for otherwise interested individuals and groups to embrace recommendations. The low response rate from employers forces us to think even more deliberately about the points of leverage not just in graduate preparation, but also in the employment opportunities available to graduates. Certain areas have a well-established track record of employing humanities grads, while others do not. Funders (especially the Mellon Foundation) and para-academic organizations (such as the Council on Library and Information Resources, and the American Council of Learned Societies) have worked to incentivize employers to hire PhDs, often through the creation of short-term fellowships and post-docs. In theory, post-doctoral programs that place graduates in public humanities positions could enable employers to realize the value of making this type of hire, making it more likely that they would continue to seek out similar candidates for long-term employment after the conclusion of the funding period. In practice, however, there is not yet data to support this desired outcome. Further, post-doctoral roles may put graduates in difficult situations due to their duration, funding structure, and often insufficient mentorship [Brown 2011] [Posner 2012]. While post-doctoral positions have long been a standard component of career paths in many STEM fields, they have not traditionally been required for humanists; their growing prominence creates the risk of “credential creep” as hiring committees seek candidates with an increasing range of degrees and skills [Gailey and Porter 2011]. 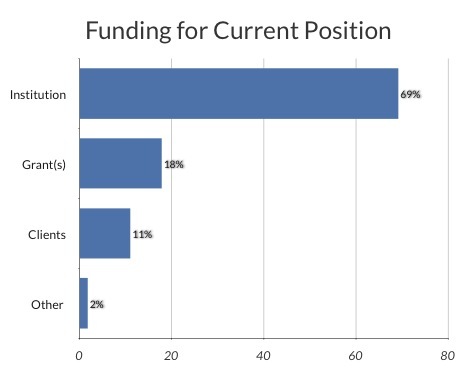 Nonetheless, despite the legitimate concern that encouraging graduate students to pursue more varied lines of employment pushes them into short-term positions with unstable funding, in fact relatively few respondents to the primary (employee) survey report this as their situation, with only 18% in positions funded wholly or partially by grants (see Figure 1). Even fewer are in positions with specified end dates (see Figure 2). When graduate students begin their studies, their career expectations remain strongly aligned with the goal of becoming faculty. 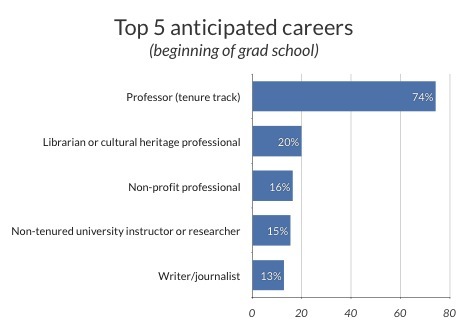 Asked to identify the career(s) they expected to pursue when they started graduate school, 74% of respondents indicated that they expected to obtain positions as tenure-track professors (see Figure 3). That response far outpaces any others, even though respondents could select multiple options (note that this is why the results add up to more than 100%). Instead of working as faculty members as they had anticipated doing, respondents reported working in a number of different types of workplaces, with a large majority working within universities, libraries, and other cultural heritage organizations (see Figure 4). What is perhaps more interesting is these respondents’ level of confidence: of the 74% anticipating a faculty career, 80% report feeling fairly certain or completely certain about that future path (see Figure 5). 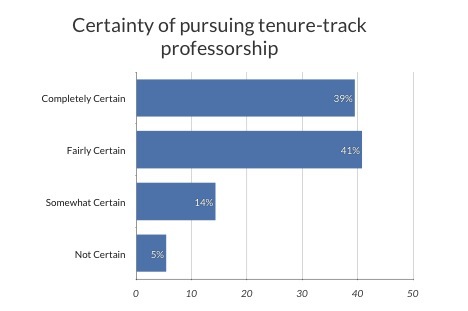 These numbers are particularly striking given that because the survey targeted alternative academic practitioners, virtually none of the survey respondents are tenured or tenure-track professors; they are all working in other roles or domains. It is worth recalling that respondents were reflecting on and reporting impressions they had prior to beginning their graduate study. The time span is broad, with entrance years for those who completed the PhD ranging from 1962 to 2008. While this range means that the results do not show a contemporary snapshot, they do give us a clear sense of the landscape over time. As such, it is clear that even among the body of people who are working in other roles, the dominant expectation at the outset of graduate school was for a future career as a professor. These expectations are not at all aligned with the realities of the current academic job market, and they haven’t been for some time. The labor equation for university teaching has shifted dramatically in recent years, with non-tenure-track and part-time labor constituting a strong majority of instructional roles [AAUP 2013]. The data shows that historically, many graduate students have begun their studies without a clear understanding of their future employment prospects. While the degree of transparency about the likelihood of obtaining a tenure-track position may have improved in recent years, overall the responses signal that we are failing to bring informed students into the graduate education system. Deepening the problem, students report receiving little or no preparation for careers outside the professoriate during the course of their studies, even though the need for information about a variety of careers is acute. 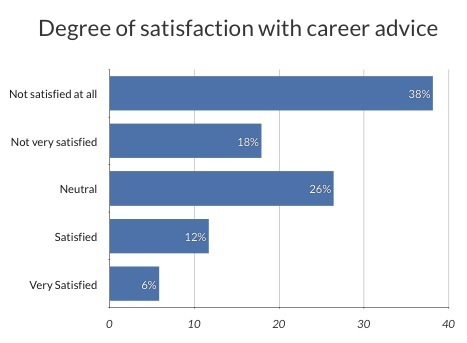 Only 18% reported feeling satisfied or very satisfied with the preparation they received for alternative academic careers (see Figure 6). The responses are rooted in perception, so there may be resources available that students are not taking advantage of — but whatever the reason, they do not feel that they are being adequately prepared. That perception reveals significant room for improvement throughout the higher education system. Further, if programs devote time and funding to resources for career preparation, it is essential to offer and promote them from the very beginning of graduate students’ careers. Failing to do so may limit the effectiveness of such interventions. The reasons that people pursue careers beyond the tenure track are varied and complex (see Figure 7). Location tops the list, which makes sense as a contrast to the near total lack of geographic choice afforded by academic job searches. Beyond that, people report pursuing non-faculty jobs for reasons ranging from the practical and immediate — salary, benefits, family considerations — to more future- and goal-oriented reasons, such as the desire to gain new skills, contribute to society, and advance in one’s career. The open text responses reflect a wide variety of reasons for taking a position. The desire for greater freedom than they perceived a faculty position might offer, or simply a different environment than a university department, appealed to many. One respondent cited the prospect of “An interesting job in a field where wide-ranging intellectual curiosity is an asset” to be a very important reason for pursuing the career that he or she chose. Another mentioned the “tremendous autonomy” their chosen position offered. Much more simply, though, a large number of respondents cited the need to find a stable job as their primary motivation. Some respondents considered themselves “overwhelmed,” “burned out,” or “frustrated” [Rogers 2013a]. A note of urgency and, sometimes, desperation came through in a number of these responses. The survey results make it clear that the varied careers of humanities scholars require a broad range of skills, some of which vary by position, while others are common across multiple sectors (see Figure 8). Some of the skills listed are core elements of graduate work, such as writing, research skills, and analytical skills. Keeping in mind that the employer sample was quite small compared to the main sample, it is worth noting that both groups value many of the skills at similar levels; however, there are a couple of discrepancies. First, employees tended to undervalue their research skills relative to employers. There are several possible reasons for this: first, there may be some activities that employees do not recognize as research because it leads to a different end result than they might expect, such as a decision being made, rather than a journal article being published. Second, research may be a skill that has become so natural that former grad students fail to recognize it as something that sets them apart in their jobs. On the other hand, employees tended to overvalue the importance of project management among the competencies that their jobs required. 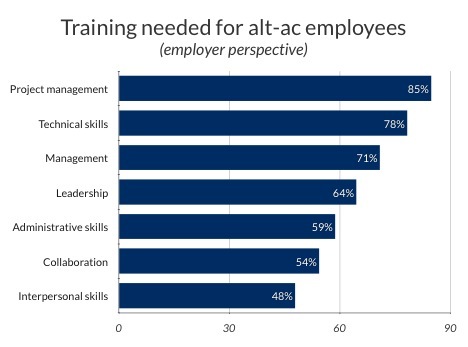 That said, project management actually tops the list of areas where humanities-trained employees needed training, according to employers (see Figure 9). This suggests that employees overvalued the skill because they found it to be a challenging skill that they needed to learn on the job. Employers also cited technical and managerial skills as areas that needed training. While the importance of those two skills would certainly depend on the type of position, others, such as collaboration, are useful in almost any work environment. Even simple things, like adapting to office culture, can also prove to be surprisingly challenging if graduates have not had much work experience outside of universities. The good news is that all of the elements that make stronger employees would also be greatly beneficial for those grads that do go on to become professors. By rethinking core curricula in such a way that students gain experience in things like collaborative project development and public engagement, departments would be strengthening their students’ future prospects regardless of the paths they choose to take. While students are generally well prepared for research and teaching, they aren’t necessarily ready for the service aspect of a professorship, which incorporates many of the same skills that other employers seek. Collaboration and an understanding of group dynamics, for instance, would help committee members to work more effectively together. Many of the skills also contribute to more creative teaching and research. Better project management skills would help faculty to make good use of sabbatical years and to balance the anticipated fluctuations in workload, while technological skills would lead to new kinds of assignments in the classroom and new research insights. And yet, these skills are not typically taught as part of the graduate curriculum. Methods courses, which could be used as an opportunity to introduce students not only to the critical skills and approaches they will need, but also to key issues of professionalization and post-graduate realities, are inconsistent and sometimes completely absent, with 28.6% of respondents reporting that their programs offered no methods courses whatsoever. 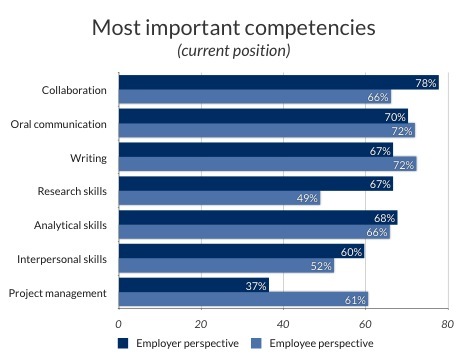 It is not surprising that employers find that humanities-trained employees need to develop in new skills like project management and collaboration. Employees themselves also recognize that these are by and large not skills that they acquire in graduate school (see Figure 10). 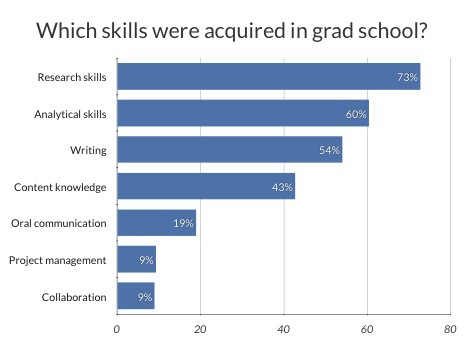 Skills like collaboration, project management, interpersonal skills, and technical skills are all valuable in a range of career paths that attract humanities scholars, but graduate programs do not typically prepare their students in these areas. Even among those who felt that their skills in these areas were strong, they noted that they gained them outside of their graduate program — for instance, through jobs or internships. Graduate programs could include opportunities to learn and apply these kinds of skills by partnering with organizations willing to host interns, or by simulating a work environment through collaborative projects with public outcomes (see the Recommendations section for more concrete ideas). At the same time, graduate students may describe their skills using vocabulary that does not resonate outside of academic circles, making it challenging for graduates to translate their abilities into aptitudes employers seek. One aspect of career training that would be beneficial to graduates is learning how to recast their skills. For instance, a dissertation may be more interesting to a potential employer if it is framed as a complex, long-term project involving research, written and oral communication, and a series of deadlines completed on time. Further, the core skills of graduate training — especially research, writing, and analytical skills — are highly valuable to employers, and often enable employees to learn new skills quickly. Notably, regardless of respondents’ primary responsibilities, many reported that they still engaged in some type of research or teaching. Just over half of respondents (51%) continue to teach in some way, while an even greater proportion, 68%, perform research as a part of their job. Many (61%) also pursue these activities outside their position. Respondents noted that in their roles, teaching and research often differ significantly from the usual forms they take in academic settings, and are frequently much less formal. Activities that feel much like teaching may be described as presentations, mentorship, and even management. Research may be fast-paced, requiring that one seek out and synthesize information quickly in order to facilitate decision-making. By understanding these differences, graduates can better prepare themselves not only to be competitive candidates, but also to succeed in varied workplaces. Because the processes and products of skills like teaching and research can seem foreign in new employment environments, it is critical that students don’t undervalue (or insufficiently articulate) the ways that graduate study equips them for other roles, particularly in the methods and generalized skills that can be broadly applied. It seems clear from the findings that the persistent myth that there is only a single academic job market available to graduates is damaging, and extricating graduate education from the expectation of tenure-track employment has the potential to benefit students, institutions, and the health of the humanities more broadly. However, as long as norms are reinforced within departments — by faculty and students both — it will be difficult for any change to be effective. Despite that challenge, there are a number of effective interventions that programs can undertake. There is significant room for improvement in career preparation strategies within humanities curricula that will not sacrifice disciplinary rigor or depth. Many of the skills that alternative academics identify as crucial to their positions — things like project management, collaboration, and communication — are also highly beneficial to those working within the professoriate. Structuring courses and projects in a way that emphasizes the acquisition of these skills contributes not only to the success of students who pursue employment outside the tenure track, but also to the vibrant research, teaching, and service of those who pursue academic roles. Consider evaluating and modifying required aspects of master's- and doctoral-level curricula in favor of including courses that help students to prepare for the wide-ranging career paths that they may pursue upon completion. This is not to say that graduate programs should become vocational training grounds; rather, this recommendation encourages programs to reconsider the ways in which they currently train graduate students for a single career path — that of the professoriate — and instead broaden the scope of training in order to reflect more accurately the post-graduate realities of their students. Incorporating such training will better equip students for any career — including the professoriate — without detracting from more traditional methodological training. In fact, done well, helping students to learn some of the critical skills highlighted by the survey can actually deepen their grasp of standard disciplinary methods. Such a project would not only guide students towards the disciplinary framework that they will need throughout their degree program, but would also enable them to learn and apply skills that will improve their research skills and future employment prospects. Bethany Nowviskie has written compellingly on the topic of rethinking methods courses, and the Praxis Program that she leads at the University of Virginia’s Scholars’ Lab, while extracurricular in nature, is an exemplary illustration of how successful such a reformulation can be [Nowviskie 2012b] [Nowviskie 2012c]. Good data management habits, project planning, collaboration skills, and more will have immediate value as well as future value. Graduate students wishing to pursue an active research career will benefit with a greater understanding of traditional and emerging publishing options, and best practices for planning, research, writing, and submitting scholarly articles. Students uncertain about what career they wish to pursue, or those explicitly interested in alternative academic career options, will also benefit with a greater understanding of the research and publication environment, a sense of existing platforms and opportunities for new developments, and a deeper understanding of broader academic structures, which many employers and employees have noted is valuable. Form more deliberate partnerships with the inter- and para-departmental structures — either within or outside their home institution — that are already engaging in this kind of work. Humanities centers have jump-started excellent training programs, research projects, and public-facing work. For example, under the direction of Kathleen Woodward, the Simpson Center for the Humanities at the University of Washington offers a cross-disciplinary Certificate in Public Scholarship, numerous fellowships, and a slate of public programing; the center has also cultivated numerous campus-community partnerships [“Simpson Center for the Humanities” 2013]. The reports from SCI’s meetings on graduate education reform highlight a number of similarly strong examples, as well as future possibilities [Rumsey 2013a] [Rumsey 2012]. Departments that would like to move in similar directions can model the kinds of programs being offered by these centers, and might also consider pursuing inter-institutional collaborations as appropriate. There may be valuable opportunities to share infrastructure (physical and digital), expertise, time, and funding across multiple institutions, as a new partnership between Hope College and Michigan State University demonstrates [Pannapacker 2013a]. Departments, libraries, and centers should model the best practices they hope to teach to their students: collaboration, equal credit, public engagement, and transparency. Many respondents cited an internship or previous employment as crucial to their current position, yet graduate programs more often encourage students to remain cloistered within the confines of the department. Departments could build alliances with local cultural heritage organizations in their city or town — museums, libraries, archives, etc. — and work with students to engage with those partners either through their research, or through short-term employment or internships. Professional associations can provide useful opportunities for networking and professionalization that extend beyond the limitations of an individual department. Some, such as the American Alliance of Museums or the American Association for State and Local History, offer professional development opportunities more specifically geared toward careers in various realms of public humanities. Rather than evaluating students exclusively on their writing, encourage faculty to develop collaborative project assignments that allow students to work together in a variety of roles and to communicate their findings to an array of expected audiences. Training faculty in how to evaluate such work is critical, and can be challenging, especially where digital work is concerned. Tools such as the guidelines developed by the Modern Language Association can help facilitate the process of making different kinds of scholarship legible to evaluators [“Guidelines for Evaluating Work in Digital Humanities and Digital Media” 2012]. Departments should also lobby for the acceptance of non-traditional dissertations that allow students to assemble and present their research in a way that makes sense for their future goals, and for the nature of their particular project. One way to do this is to compile lists of people working within the university system that hold advanced degrees, so that students can see potential paths and make useful connections. Stanford has taken positive steps in this direction by listing staff members that are willing to serve as mentors to humanities doctoral students, and by developing a speaker series to highlight the varied careers of these members of their community [Stanford University 2012]. At present, very little data is available from departments about the career outcomes of their graduates [Pannapacker 2013b]. While 85% of graduate deans reported dissatisfaction with the success of tracking former students, and cited lack of current contact information as the greatest hindrance to such tracking, research by a third-party consultancy, the Lilli Research Group, has shown that it is possible to determine the professional outcomes of graduates with a surprising degree of accuracy using only public records [Wood 2012]. Along the same lines, the Chronicle of Higher Education has launched a new initiative, called the PhD Placement Project , to seek new ways of collecting and disseminating this information [“Ph.D. Placement Project” 2013]. While social media can provide a surprising amount of information about former students’ current careers (c.f. [Patton 2012]), concerted efforts from departments and professional organizations are critical to standardizing the process to make it easier for prospective students to compare results across institutions. Robust, standardized tracking would also make it possible to compare the results of different kinds of programs in order to better evaluate the effectiveness of new models. Implementing the kinds of changes described here will undoubtedly be challenging. Many programs face severe budgetary limitations, and simply do not have the funding needed to explore new projects. Faculty members may lack the time or incentives to take on leadership roles or develop new curricula, or may not have expertise in the areas where a department wishes to grow. Similarly, graduate students may know of opportunities that they’d like to pursue, but may lack funding for them, or may be unable to add additional commitments to an already overextended schedule. Both students and faculty members may perceive a risk in exploring opportunities outside the department’s standard fare. The structures of hiring, promotion, and tenure often do not reward risk-taking of this nature, and students or faculty who do pursue nonstandard opportunities may be called upon to do additional labor to make their work legible to colleagues and evaluators. Even though these difficulties are very real, a number of programs have taken positive steps toward change and can be looked to as models. As a counterpoint and illustration to the survey data, SCI has recently launched another project that we hope will be a useful complement to the study: the Praxis Network [“Praxis Network” 2013]. The Praxis Network is a new showcase of a small collection of programs that offer new approaches to methodological training. Each of these programs can be thought of as one possible response to the question of how to equip emerging scholars for a range of career outcomes without sacrificing the core values or methodologies of the humanities, and without increasing time-to-degree. The goals of each are student-focused, digitally-inflected, interdisciplinary, and frequently oriented around collaborative projects and public engagement. They share similar goals but different structures. Because most of the programs are relatively new, it is too early to provide data on graduate outcomes. So far, however, students who complete the programs do appear to be highly competitive for the roles that they pursue, with some graduates working in university libraries, software companies, and as faculty members. Other innovative programs are emerging and growing at a wide range of institutions. For instance, the Digital Humanities Summer Institutes, started in 2001 at the University of Victoria, offer weeklong courses in topics related to the digital humanities [“Digital Humanities Summer Institute” 2014]. The DHSI model, which has recently expanded to other institutions around the world (currently in Halifax, Nova Scotia, Canada; Leipzig and Paderborn, Germany; Beirut, Lebanon; Bern, Switzerland; Oxford, UK; and Indianapolis, Indiana, U.S.), offers those within the communities of humanities scholars an opportunity to develop new skills as peers. A number of consortia are developing as well, such as Humanities Without Walls, which will connect scholars at fifteen research institutions in the Midwest to facilitate collaborative research and offer career-related workshops to pre-doctoral students interested in careers beyond the professoriate [“Illinois Program for Research in the Humanities” 2014]. The appendix of the Report of the MLA Task Force on Doctoral Study in Modern Language and Literature [“Report of the Task Force on Doctoral Study” 2014] profiles a number of other innovative doctoral programs, all of which offer compelling models. Some of these programs are fairly small and competitive, which has several advantages: students benefit from strong mentorship and close collaborations with one another when working in small cohorts. Some are extracurricular, and are housed outside of departments (for instance, in libraries or humanities centers), which can allow for greater flexibility and interdisciplinarity. Now that we have the benefit of more data, however, we believe that incorporating elements of this type of training into the structure of departments themselves is an important move, especially in terms of sustainability (gaining a hard budget line, rather than operating solely or primarily on grant funding) and in terms of access (ensuring that all graduate students benefit from the training opportunities). With the availability of new data to work from, the Praxis Network programs to use as inspiration or models, and the recommendations above as possible guiding principles, graduate programs now have a robust set of tools available that can help facilitate curricular assessment and new initiatives. With increasing pressures from many university administrations to evaluate effectiveness and to consider what new models might be in the long-term interest of an institution, humanities programs have a strong incentive to demonstrate the ways that their graduate programs contribute to the vitality of the university and the broader public sphere. Humanists should be making a case for effective modes of engaging with new technologies and new skills, or that role may be entrusted to private corporations that lack a clear interest in the sustained vitality of higher education. While the recommendations outlined in this report represent important steps to take, they represent only a small element of a much broader picture of higher education, in which a great many issues must be addressed simultaneously, as Michael Bérubé has convincingly argued [Bérubé 2013]. Poor labor conditions for many part-time and contingent faculty members, an average time to degree of nearly a decade [“Survey of Earned Doctorates, 2011” 2012], and increasingly burdensome levels of student debt are problems that should concern people committed to humanities education, whether they work in universities, cultural heritage organizations, or elsewhere. Further, as modes of scholarly production and authoring continue to shift, the standards for evaluating scholarship for purposes like hiring and promotion must be reassessed. The health of humanities education affects the preparedness of future faculty and staff; the perceived public value of the discipline; the quality of humanities research and other work products; and much more. Equipping graduate students with the skills and literacies needed for 21st century scholarly work — from technical fluency to an understanding of organizational structures — is critical to ensuring continued rigorous and creative research and other work products. Remaining wedded to outmoded systems, including a model of apprenticeship in higher education that reinforces the false assumption that professorship is the only meaningful career for humanities doctoral recipients, does a tremendous disservice to all individuals and organizations that benefit from humanistic perspectives. It is essential that humanities programs begin to equip graduate students for varied career paths and deep public engagement, while also emphasizing the value of working in a range of sectors beyond the tenure track. Professorships should not be seen as the sole prestigious career for humanists; instead, any intellectually rewarding role that contributes to society should be seen as a tremendously successful outcome. The time is ripe for prestige to be measured not only by tenure track placement rates, but also through the many other careers that graduates choose to pursue, and ways that those paths positively benefit the broader ecosystem of our shared cultural heritage. Findings from SCI’s study indicate that upon starting graduate school, 74% of respondents expected to pursue a career in the professoriate. For more details, see Figure 3. I contributed to the development of the Praxis Network as part of my role with SCI. Unfortunately, I cannot compare the employment rates of different types of graduate programs. Most graduate programs do not track their graduates’ employment paths. Those that do some form of tracking often include information about the graduates who go on to tenure-track faculty careers. With funding from the Alfred P. Sloan Foundation and the Andrew W. Mellon Foundation, the Council of Graduate Schools recently conducted a study to determine the feasibility of tracking career pathways across multiple disciplines. The project report from that study was released in December 2014 [Council of Graduate Schools 2014]. AAUP 2013 “Here’s the News: The Annual Report on the Economic Status of the Profession, 2012-13” (2013): http://www.aaup.org/report/heres-news-annual-report-economic-status-profession-2012-13. Brown 2011 Brown, Ryan. “Postdoctoral Fellowships in the Humanities Gain Importance in Career Paths.” The Chronicle of Higher Education (August 28, 2011): http://chronicle.com/article/Postdoctoral-Fellowships-in/128819/. Bérubé 2013 Bérubé, Michael. “The Humanities, Unraveled.” The Chronicle of Higher Education (February 18, 2013): http://chronicle.com/article/Humanities-Unraveled/137291/. Cassuto 2012 Cassuto, Leonard. “In Search of Hard Data on Nonacademic Careers.” The Chronicle of Higher Education (September 3, 2012): http://chronicle.com/article/In-Search-of-Hard-Data-on/134030/. Council of Graduate Schools 2012 Council of Graduate Schools. “Pathways Through Graduate School and Into Careers” (2012): http://pathwaysreport.org/. Council of Graduate Schools 2013 “CGS Launches Project to Study Feasibility of Tracking PhD Career Pathways.” Council of Graduate Schools (2013): https://www.cgsnet.org/cgs-launches-project-study-feasibility-tracking-phd-career-pathways. Council of Graduate Schools 2014 Council of Graduate Schools. “Understanding PhD Career Pathways for Program Improvement” (2014): http://www.cgsnet.org/understanding-career-pathways. Fain and Rivard 2013 Fain, Paul, and Ry Rivard. “California Bill to Encourage MOOC Credit at Public Colleges.” Inside Higher Ed (March 13, 2013): http://www.insidehighered.com/news/2013/03/13/california-bill-encourage-mooc-credit-public-colleges. Gailey and Porter 2011 Gailey, Amanda, and Dot Porter. “Credential Creep in the Digital Humanities.” #Alt-Academy (May 6, 2011): http://mediacommons.futureofthebook.org/alt-ac/pieces/credential-creep-digital-humanities. IPEDS 2009 Integrated Postsecondary Education Data System. U.S. Department of Education, National Center for Education Statistics (Winter 2009-10): http://nces.ed.gov/ipeds/datacenter/. Jaschik 2012 Jaschik, Scott. “Survey Finds New Ph.D.’s Less Likely to Have Job Commitments.” Inside Higher Ed (December 4, 2012): http://www.insidehighered.com/news/2012/12/06/survey-finds-new-phds-less-likely-have-job-commitments. Jaschik 2013 Jaschik, Scott. “Skepticism About Tenure, MOOCs and the Presidency: A Survey of Provosts.” Inside Higher Ed (January 23, 2013): http://www.insidehighered.com/news/survey/skepticism-about-tenure-moocs-and-presidency-survey-provosts. Laurence 2014a Laurence, David. “Our PhD Employment Problem, Part 1.” The Trend (February 26, 2014): http://mlaresearch.commons.mla.org/2014/02/26/our-phd-employment-problem/. Laurence 2014b Laurence, David. “Our PhD Employment Problem, Part 2.” The Trend (March 11, 2014): http://mlaresearch.commons.mla.org/2014/03/11/our-phd-employment-problem-part-2/. Nerad and Cerny 1999 Nerad, Maresi, and Joseph Cerny. “From Rumors to Facts: Career Outcomes of English PhDs.” ADE Bulletin 32 (7): 11 (1999). Nowviskie 2012a Nowviskie, Bethany. “#altac Origin Stories (with Tweets).” Storify (2012): http://storify.com/nowviskie/altac-origin-stories. Nowviskie 2012b Nowviskie, Bethany. “It Starts on Day One.” The Chronicle of Higher Education (2012): http://chronicle.com/blogs/profhacker/it-starts-on-day-one/37893. Nowviskie 2012c Nowviskie, Bethany. “A Digital Boot Camp for Grad Students in the Humanities.” The Chronicle of Higher Education (April 29, 2012): http://chronicle.com/article/A-Digital-Boot-Camp-for-Grad/131665/. Pannapacker 2013a Pannapacker, William. “Cultivating Partnerships in the Digital Humanities.” The Chronicle of Higher Education (May 13, 2013): http://chronicle.com/article/Cultivating-Partnerships-in/139161/. Pannapacker 2013b Pannapacker, William. “Just Look at the Data, If You Can Find Any.” The Chronicle of Higher Education (June 17, 2013): http://chronicle.com/article/Just-Look-at-the-Data-if-You/139795/. Patton 2012 Patton, Stacey. “Where Did Your Graduate Students End Up? LinkedIn Knows.” The Chronicle of Higher Education (June 11, 2012): http://chronicle.com/article/Where-Did-Your-Graduate/132197/. Posner 2012 Posner, Miriam. “The Digital Humanities Postdoc.” Miriam Posner’s Blog (2012): http://miriamposner.com/blog/?p=1219. Rogers 2013a Rogers, Katina. “Survey on Humanities Graduate Education and Alternative Academic Careers (Main Data).” Libra: Online Archive of University of Virginia Scholarship (2013): http://libra.virginia.edu/catalog/libra-oa:3272. Rogers 2013b Rogers, Katina. “Survey on Humanities Graduate Education and Alternative Academic Careers (Employer Data).” Libra: Online Archive of University of Virginia Scholarship (2013): http://libra.virginia.edu/catalog/libra-oa:3500. Rumsey 2012 Rumsey, Abby Smith. “Rethinking Humanities Graduate Education, October 2012”. Maryland Institute for Technology in the Humanities: University of Maryland, College Park (2012): http://libra.virginia.edu/catalog/libra-oa:3266. Rumsey 2013a Rumsey, Abby Smith. 2013a. “Rethinking Humanities Graduate Education, March 2013”. Walter Chapin Simpson Center for the Humanities: University of Washington (2013): http://libra.virginia.edu/catalog/libra-oa:3266. Rumsey 2013b Rumsey, Abby Smith. “Creating Value and Impact in the Digital Age Through Translational Humanities.” CLIR Ruminations (April 25, 2013): http://www.clir.org/pubs/ruminations/03smithrumsey/. Stanford University 2012 “Mentors for Humanities PhDs.” Stanford University (2012): http://shc.stanford.edu/phd-mentors/. Wood 2012 Wood, Maren. “What Doors Does a Ph.D. in History Open?” The Chronicle of Higher Education (October 30, 2012): http://chronicle.com/article/What-Doors-Does-a-PhD-in/135448/. “#Alt-Academy” 2011 “#Alt-Academy” (January 2011): http://mediacommons.futureofthebook.org/alt-ac/. “Carnegie Initiative on the Doctorate” n.d. “Carnegie Initiative on the Doctorate (CID)” (n.d.): http://gallery.carnegiefoundation.org/cid/. “Digital Humanities Summer Institute” 2014 “DHSI | Digital Humanities Summer Institute” (2014): http://www.dhsi.org. “Guidelines for Evaluating Work in Digital Humanities and Digital Media” 2012 “Guidelines for Evaluating Work in Digital Humanities and Digital Media.” Modern Language Association (2012): http://www.mla.org/guidelines_evaluation_digital. “Humanities at Work” n.d. “The Humanities at Work.” Woodrow Wilson National Fellowship Foundation (n.d.): http://woodrow.org/about/past-programs/#HW. “Illinois Program for Research in the Humanities” 2014 “IPRH | Illinois Program for Research in the Humanities” (2014): http://www.iprh.illinois.edu/programs/hww.html. “Ph.D. Placement Project” 2013 “The Ph.D. Placement Project.” The Chronicle of Higher Education (2013): http://chronicle.com/blogs/phd/. “Praxis Network” 2013 “The Praxis Network” (2013): http://praxis-network.org/colophon.html. “Praxis Program” 2013 “The Praxis Program” (2013): http://praxis.scholarslab.org/. “Report of the Task Force on Doctoral Study” 2014 “Report of the Task Force on Doctoral Study in Modern Language and Literature.” Modern Language Association (2014): http://www.mla.org/report_doctoral_study_2014. “Responsive PhD” 2005 “The Responsive PhD: Innovations in U.S. Doctoral Education.” The Woodrow Wilson National Fellowship Foundation (2005): http://www.woodrow.org/responsivephd/. “Simpson Center for the Humanities” 2013 “Simpson Center for the Humanities.” Simpson Center for the Humanities . Accessed June 17 (2013): http://depts.washington.edu/uwch/. “Survey of Earned Doctorates, 2011” 2012 “Survey of Earned Doctorates, 2011.” National Science Foundation (2012): http://www.nsf.gov/statistics/sed/digest/2011/. “VersatilePhD” 2010 “VersatilePhD” (2010): http://versatilephd.com/.